What does it mean to write with ‘soul’? ‘Soulful’ gets defined as the “expression of profound emotion”. But it’s not enough to express it: you need to invoke it in the reader. Fiction – and some forms of nonfiction – require that you put the reader through a well-crafted emotional experience. Where so many manuscripts go wrong is that if they do not outright imitate, they at least do not go far enough in mining the author’s experience for what is distinctive and personal. So many manuscripts feel safe. They do not force me to see the world through a different lens. They enact the author’s concept of what their novel should feel like to read rather than what their inner storyteller urgently needs to say. Finding the power buried in your novel is not about finding its theme. I would say, rather, that it is about finding you: your eyes, experience, understanding and compassion. Ignore yourself and your story will be weak. Embrace the importance of what you have to share with the rest of us and you have the beginning of what makes novels great. This is easy to say, but the truth is that even the most accomplished writers can struggle with the concept. Soulful writing is part technique, part art…and the willingness to make yourself vulnerable. It’s the ability to “go there”, to “put yourself out there” in ways that feel counter-intuitive. Because we’re programmed not to do this. Some of our most powerful psychological defense mechanisms involve rationalizing and intellectualizing in order to protect ourselves from the hard raw work of emotion. But when we write like this, we remain stuck on the surface of the narrative and fail to engage the reader. The reader is looking for a full-blooded engagement. The reader wants you to shake him up, move him, show him something new, blow the top of his head open (not literally). The reader doesn’t want you to protect him, he wants you to transport him. Vulnerability is not the same, in my mind, as oversharing or being self-indulgent. Oversharing is about telling the reader stuff he doesn’t care to hear; self-indulgence is about writing hollow prose that doesn’t mean anything to anybody except the writer (and maybe the writer’s mother). When you overshare, when you self-indulge, you’re skating the surface. You’re telling the reader what to feel instead of drawing her into an experience. If soulful writing invokes genuine emotion, sentimental writing tries to coax an emotional reaction through surface manipulations, stereotypes and clichés. Sentimental writing doesn’t “go there”, and as a result it comes off as contrived. And fake. 1. Write from the body. Stay grounded and focused on the physical: what the character hears, sees, smells, thinks, and feels. It’s easy to get so lost in the character’s inner musings, philosophizing and monologues that the reader gets lost as well…and not in a good way. (Remember that intellectualizing is a defense mechanism that is specifically designed to reduce or eliminate emotion.) Make sure the reader is rooted in a concrete feeling of space and time, and let the reader experience the storyworld through the character’s physical experience of it. This will make things more immediate and vivid for the reader. 2. Identify the powerful moments in your narrative. Life is a series of moments, and fiction is a series of interrelated moments with the boring stuff cut out. Identify the true moments that move your narrative forward, and make sure you write out those moments as full-blooded scenes. Don’t summarize. Don’t tell. Don’t get abstract or philosophical. Show. A level movies had approximately 10 to 20 scenes total and B-level movies had 35-60 scenes total. This happened in every single case. Some A-level movies are now three hours long, but even so, the better movies just don’t have as many scenes as the lesser ones do. The writers of the B movies were trying to do too much, switching scenes to try and make it seem as if there were a lot of action or drama taking place. They didn’t use the scenes they had to full effect. They didn’t use the opportunities for action and drama that were right in front of them. 3. Explore those moments. Drill deep. Ask yourself, how can you go deeper into the scene, plumb it for all its action and drama? How can you raise the stakes, reveal more about the characters, or hit on some new revelation or insight? Drill down through the layers of your characters’ motivations. Examine how they really feel about each other, or what they want from each other, or what they have to lose. Then experiment with ways of conveying this through action and dialogue. Searching the souls of your characters is a way of searching your own soul, drawing on all the knowledge and self-awareness you possess (a good writer is by necessity a student of human nature, including her own). When you’re “writing deep” — when you’re writing from that soulful, subconscious place — you might be surprised at what you find, and the added complexity and vulnerability it brings to your fiction. Give yourself 20 minutes to write the scene…and go! When we did timed exercises in my Writers On Fireworkshop, we were often impressed with just how strong and powerful and, yes, soulful the results were. Some of the best writing we saw in that workshop came out of those exercises. I think the reasons for this are twofold. When you know you have such limited time, you’re forced to cut to the chase. All the superfluous stuff gets junked and you head straight for the meat of the scene. At the same time, you’re forced to bypass the censor in your head, who wants to keep everything nice and rationalized and contained. You dive into the subconscious, which is where you find all the cool stuff. I’m not saying that an important scene should be written in nothing more than twenty minutes. But by experimenting with this approach, you can discover new things about the scene, and the characters, that enable you to go there and bring an added emotional richness to your story. 5. Read really good stuff that “goes there”. A funny thing happens when we give ourselves permission to be vulnerable; we enable other people to permit themselves to be vulnerable. Give yourself permission to invite the reader into your soul, and that reader could be yours for life. Wow–a very timely post. I have seen a huge growth in my writing as I have worked let go of fear and let the words tap deep emotion. The more honest I am with those core emotions, the stronger the writing becomes. A wonderful post. Sometimes I worry that I’m too complacent in my writing, and the tips you describe here are a great way to keep pushing me to make my writing do more. Thanks! Wise insight and interesting stats. Thanks. The part about writing from the body is crucial. I learned a lot about that from John Lee’s book of the same name (Writing from the Body). It’s a great read; makes me want to revisit it. 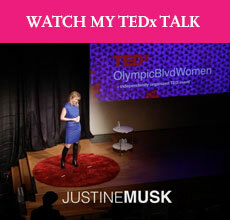 Loved this post, Justine. Thanks. You’ve covered this subject so well, I can’t think of anything to add. Again, you’ve posted important “reminders,” even for the advanced writer. It’s funny how so much of “good” writing (or writing process) boils down to psychology. Really knowing yourself is crucial to writing genuinely. Love how you censored my previous post. Hardly surprising, though. Insecure people typically have a hard time absorbing any kind of criticism, constructive or not. The need to always be “right” takes precedence over everything, doesn’t it? I can’t imagine what Elon had to go through. Whatever. I deleted it because it seemed maliciously intentioned — from someone who had, say, come over from Elon’s Huffpo piece — and I didn’t want to contaminate this blog or burden my “real” readers with that. But thank you for proving my point for me. Thanks for an entry full of insight! I agree with Donald Maass about the importance of mining your own experience as a writer. For years my writing was blocked by my over focus on style and theme – until I took a course on creative non-fiction. At that point, I switched to writing memoir and keeping a blog-memoir, too. I really liked your latest blogpost. I agree that we have to be soulful in order to create. Like Hemingway once said, “Good writing is true writing.” And this can only come from within. I always say that writing is an extension of our soul. I know from experience that I can only write when I feel that hunger. When I force myself, my writing suffers. I’m an emerging writer but I have a blog where I provide tips & advice to aspiring writers. This has helped my creative flow. Three days ago I wrote a blog post that has proved to be the most popular one I’ve done so far. It was just me, being silly, but it flowed from my brain to my fingertips like silk. I made very few changes when I was finished, and the whole process was a delight. After reading your post, I think I must subconsciously have done some of the things you describe. It was a wonderful feeling, and I’d like to work from that place all the time. I will bookmark this article and refer to it often. I have found it to be an absolute revelation in so many ways. My personal “truth bell” was sounding the whole time. Thank you for the insights and ideas you have so generously shared. Emotion is the key. Making the reader see and feel the living reality your words are trying to convey. I agree, this is a thoughtful piece. I have never written fiction, but reading this has made me consider it – I love the idea of working out how the characters actually feel, rather than think. I enjoy the work of Milan Kundera and believe this is a skill he has, you feel you are actually inside the characters. This is brilliant. I’m diving into the last revision of my novel and sensing the need to go deeper, to access some kind of creative slipstream that will take me beyond the mundane. You’ve given me lots of reminders and some new perspectives to help make this draft more ‘soulful’. I also hadn’t heard of that book by Donald Maass; I have his Breakout Novel books which have been very helpful. I’ll check out his other book. Delighted to be introduced to you via a tweet by Mark McGuinness! Excellent! I’m a visual artist, but the ideas you present are still true, in any medium. I’m definitely subscribing to your posts. I think Maass’s book “The Fire of Fiction” is excellent, I really recommend it. I like your phrase “creative slipstream”, it resonates. And Mark is great. I’m a big fan of his site. Yep. We have to take a deep breath and jump.